When a child sees an animal their eyes light up and a huge smile spreads across their face. Kids are so thrilled to be in the presence of animals, their first instinct is to dash right in and start the petting session. Unfortunately, this is not what many pets prefer and so kids need to be taught how to properly approach a pet, especially new members of the family or strange animals. When kids are about to approach an animal, they should be aware of their voices. Screaming, shrieking and talking in a loud voice can be very disturbing to animals, especially those with sensitive ears. Small animals get scared and want to run and hide because they perceive this behaviour as threatening. Dogs can become hyped up and even aggressive if a child is yelling in a shrill voice. Cats in general are not big fans of loud noises. 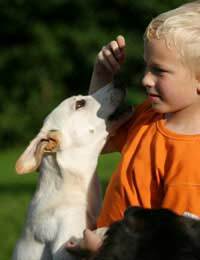 So if children can remain calm and keep their voices low and soothing, they have a much better chance of a positive response from their pets. Parents can start to teach their children how to maintain a soft voice around animals by practicing with plush toys or hand puppets for a few weeks before introducing a new pet into the home. Show your kids how to approach your pet by coming towards them from the front or side, never by sneaking up behind and grabbing them. Coming from behind can really startle your pet and result in an accidental nervous bite. Never approach an animal while it is eating or sleeping. It’s also best to have your pet in the centre of the room rather than in a corner, which makes them feel penned in and defensive. If this is the first time a child is meeting a pet, have the child sit on the ground and let the animal get used to them for a while. It’s best if an animal can sniff the child a little, getting to know their scent first before any touching starts. Kids should keep their fingers curled into a fist while the animal smells them so they don’t accidentally get bitten. Most kids become so excited when they are around animals and are so eager to pet them that they often don’t realise their own strength, especially if they are young. Explain that petting is good but pulling is bad, especially when it comes to tail and collars. Rough handling will have pets running for cover and quick, jerky movements also scare animals so show your kids how to be slow and gentle. Jumping up and down, running and stomping will have your pets running away. Also, try to make sure that your child isn’t leaning over your pet as many animals find this threatening. Nervous dogs in particular would rather have a child sit alongside them, facing in the same direction that they are. This soothes and reassures them. Dogs and cats should be stroked on the chest or back first, save head petting until the animal gets to know your child better. Small animals are most comfortable being held in kid’s laps, rather than being picked up at first. With rabbits this is particularly important. Soft, light soothing strokes down the animal’s body will reassure them and make them feel at ease. Impress upon your kids on the importance of allowing pets to leave when they want and respect the limits pets set for playtime. Explain that if they restrain their pets, then this creates fear in the animal, which will cause it to start running and hiding from your child. Ask them to think about how they would feel if someone picked them up and wouldn’t let them go to help them understand the animal’s mindset. This is very important for a good kid/pet relationship and also helps create empathy in the child. Be patient with your kids, if they are young you will probably have to remind them again and again about approaching pets properly.